A timeless print, signed, numbered, will give you pleasure every time you see it upon your wall. This fine example of marine art measures 76 x 152 cm (2′ 6″ x 5′), now a private collection. The port of Chester 1863, the more one learns about this sophisticated, complex painting The port of Chester 1863 the more one realises it is an amazing picture. We will never see its like again, for sure it would be near impossible and very expensive to produce a painting to rival to “Port of Chester 1863” today. The City of Chester Council considered this painting to be sufficiently important, significant, to merit the rare honour of a Civic Reception, over 400 invited guests attended, 95 framed prints sold that night. 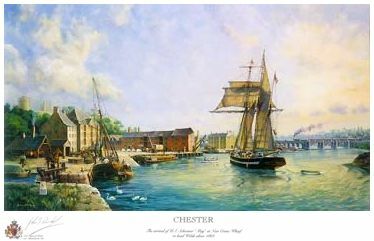 The picture of Chester port on a fine May morning in 1863 represents the combined knowledge of many people particularly from Chester who generously gave time and knowledge to ensure this is the most accurate possible historical ‘guess’ possible. The buildings, activities, the bridge, all were researched in detail. You can read more by following the ‘further reading’ link below, it’s informative, fascinating, fun, enjoy. At the Reception given by the City of Chester Council, together with A E Dutton Art Gallery we displayed some 30 pictures to 400 invited guests. 220 prints sold in 2 weeks, why? Contact us to learn. The original, a large painting five feet across is now owned by a millionaire in Plymouth. The canal barges in the picture reminded him of his boyhood.